Sorry it took so long for me to post photos from our trip to Junk Bonanza Portland. But between shows and the Etsy shop, November and December are absolutely crazy around here. 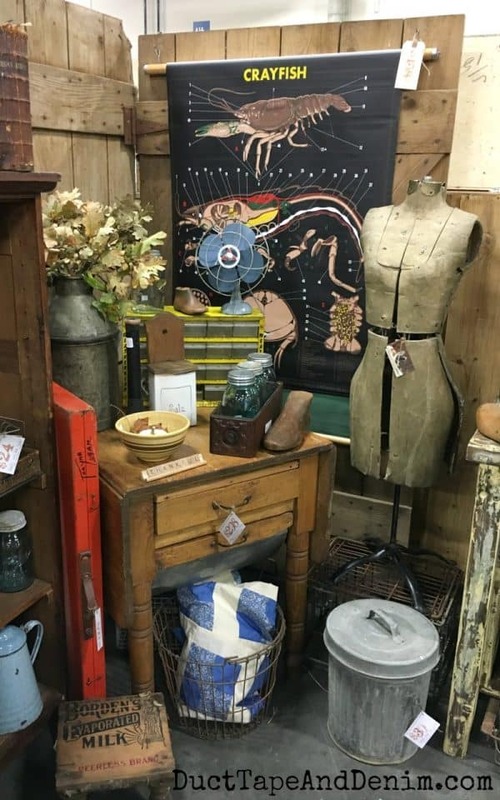 I’m just beginning to recover and I KNEW you would want to see the amazing vendors at Junk Bonanza Portland and hear about our travel adventures! I do want to make an important point before I go on. If you ever want to take photos of a vendors booth or product at any kind of flea market, shop, or craft show, PLEASE ask permission first. Some vendors are very particular about that. I did ask before I took all of the photos included in this post. All I did was ask if they minded if I took photos and shared them online. I volunteered to tag them on Facebook or Instagram whenever I could. 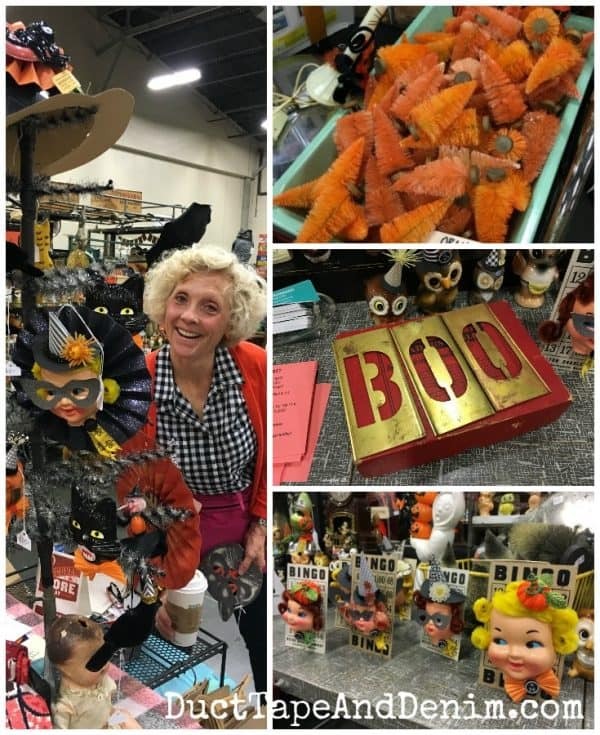 No one at Junk Bonanza Portland ( or the Junk Bonanza San Diego show) had any problem at all with it. One thing about this show that was a little confusing was that even though it’s called Junk Bonanza PORTLAND, it’s actually in Washington! When I asked, they said they name their shows after the nearest airport for those flying in for the show. We knew there was rain in the forecast but figured that wouldn’t matter because, after all, doesn’t it rain all the time in Portland? Who knew that Junk Bonanza Portland would be scheduled the same weekend that a hurricane type storm hit the Great Northwest? Numbers were WAY down because of this but we still had a lot of fun! 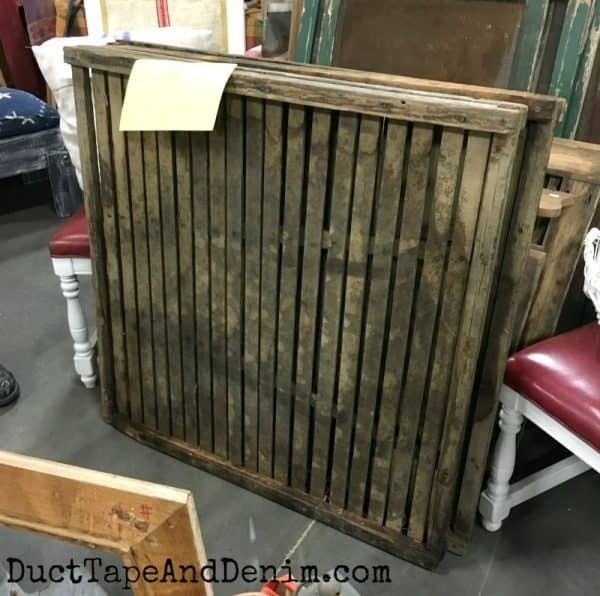 I want to start with my favorite find of the show… a vintage raisin drying rack. I had never seen one before but my friend, Barbara, had some for sale in her booth. She knew I was eyeing them but had absolutely NO room in my Jeep to haul anything extra back. Luckily, her sister, who lives less than TWO MILES away from me was storing her excess inventory! So I paid her for one and picked up my drying rack when I got home. I have some decor ideas for it but so far I’ve just used it as a photo backdrop. You can see it in the background of my Shiny Brite ornament display and my Christmas tree Advent calendar. One of my favorite parts of the show was the paint-by-number photo booth. Jordy and I took advantage of it and unfortunately for us the photo below was the only one that wasn’t blurry. Probably because we were laughing so hard. The other paint-by-numbers you see in the collage above could be painted by anyone who came to the show. Fun idea, right? And yes, I got to meet Ki. She’s as nice as you’ve heard! Junk Bonanza is very good to their vendors. Speaking of vendors, I love going to these shows just to meet them. 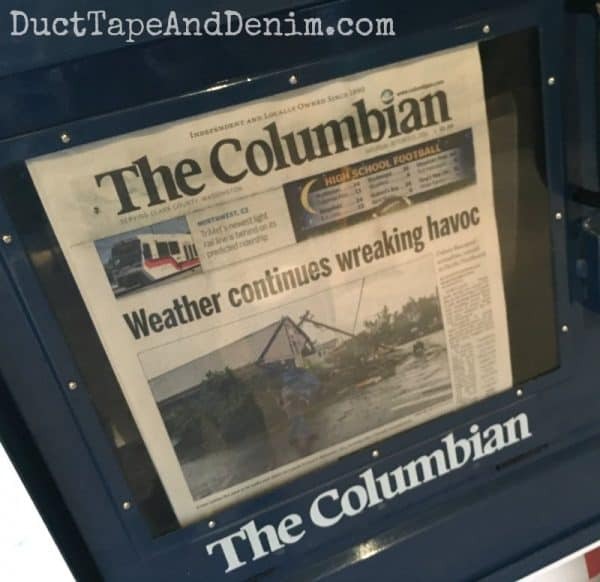 I met several new vendors at this show. Probably my favorite was Magpie Ethel. 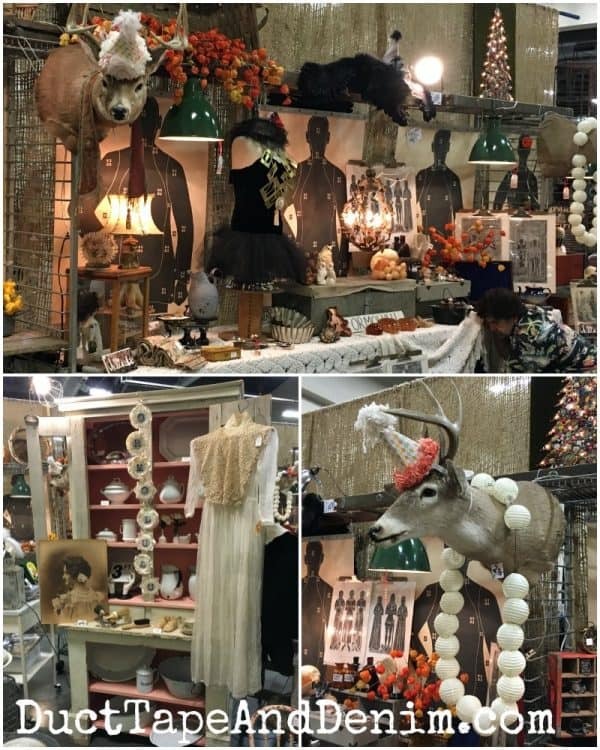 She finds and creates with some AMAZING vintage holiday decorations. She has two Etsy shops: one for handmade and one for found vintage items. Often her items sell as soon as she posts photos on Instagram so make sure you follow her there! This next booth was very creative! Their theme was that the animals were turning on us! Lots of fun decorated taxidermy with shooting targets as a backdrop. Maybe it’s just me but I love it when the vendors have a little fun in their booth like this. Follow Ormolulu on Instagram to see more of their vintage style. The vintage mannequin was what first attracted me to the booth below. But don’t you just love that Crayfish classroom poster? Reminds me of junior high life science class. 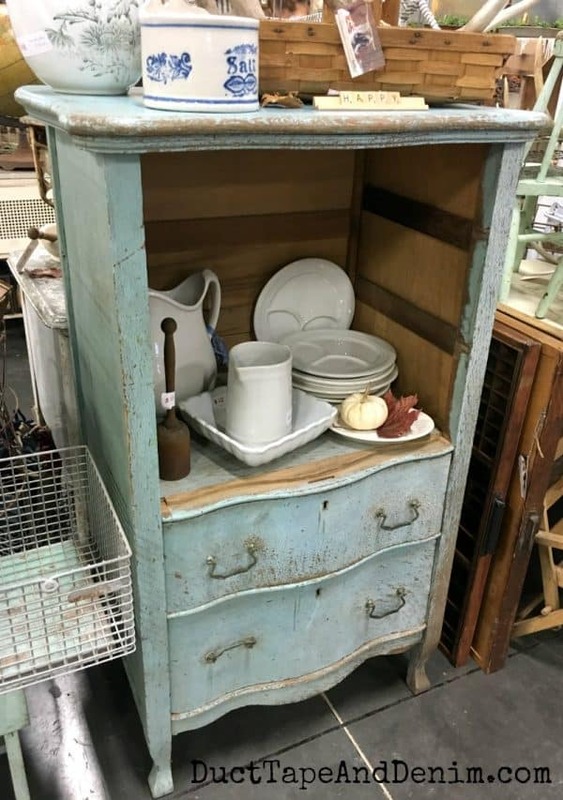 This baby blue vintage chest of drawers was beautiful even though it was missing a few drawers. 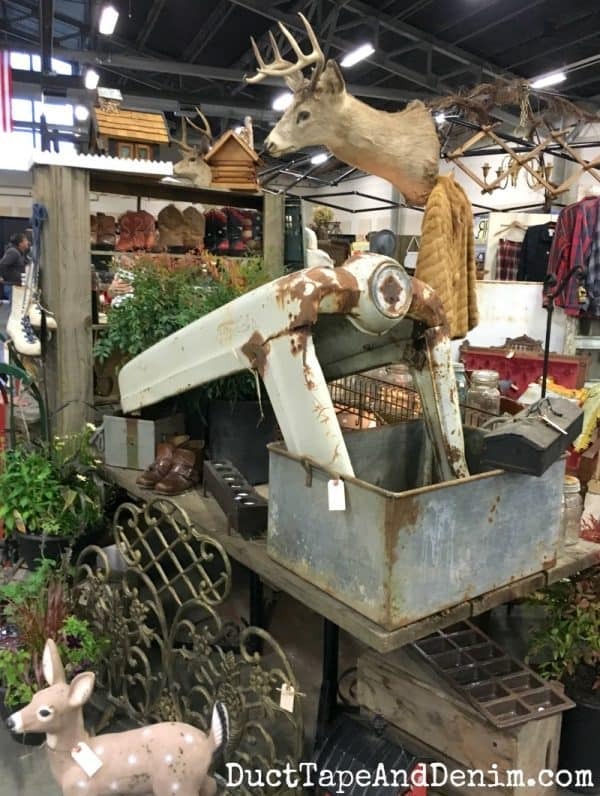 There were quite a few deer heads, antlers, and other rustic home decor pieces at Junk Bonanza Portland. This was one of my favorite booths. I went by several times and it was always fun to see how it was arranged. They restaged every time a large piece sold so it changed often. 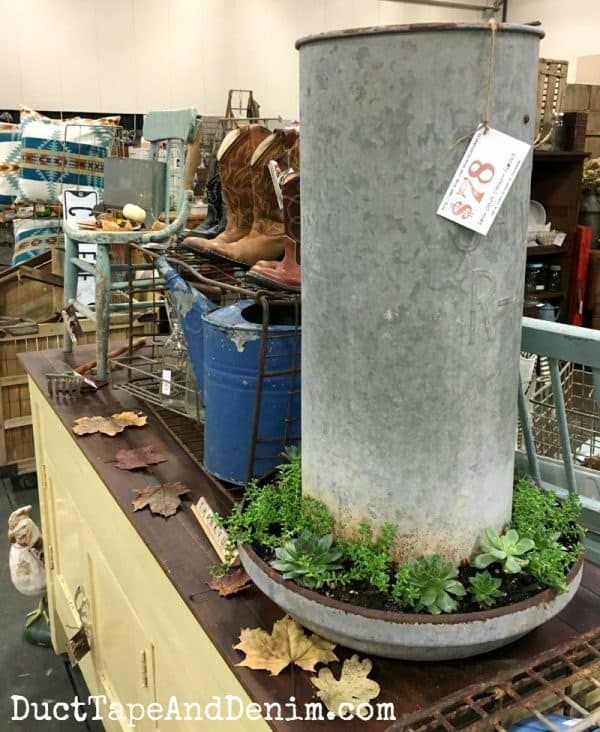 Everything can be a planter, right? Thanks for reading this far! Leave a comment and let me know if you’ve ever been to one of the Junk Bonanza shows. Maybe I’ll see you there! Thanks, Victoria! Glad you found the blog. I took so many pictures on our trip I still have another article to write. About all the things to do in Portland! What are your favorite? We look forward to going back in the fall. 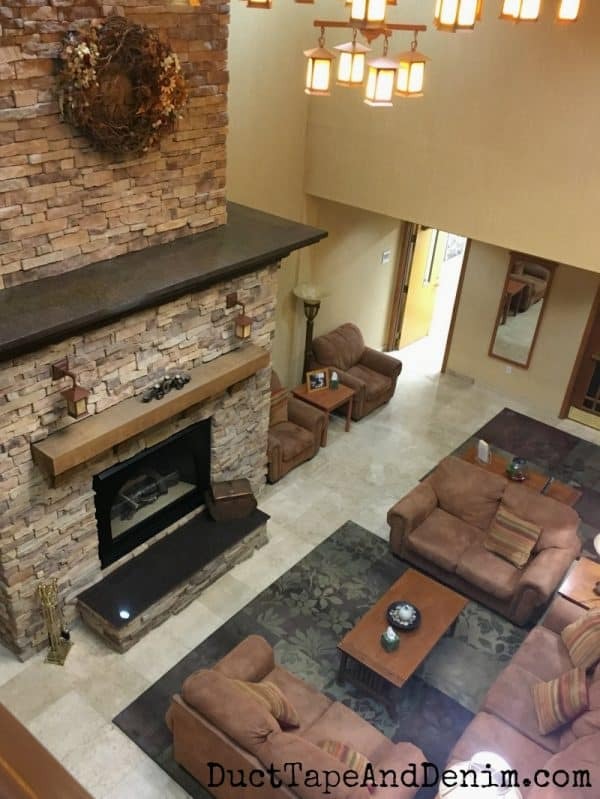 And if you ever post photos of your home I’d LOVE to see them!